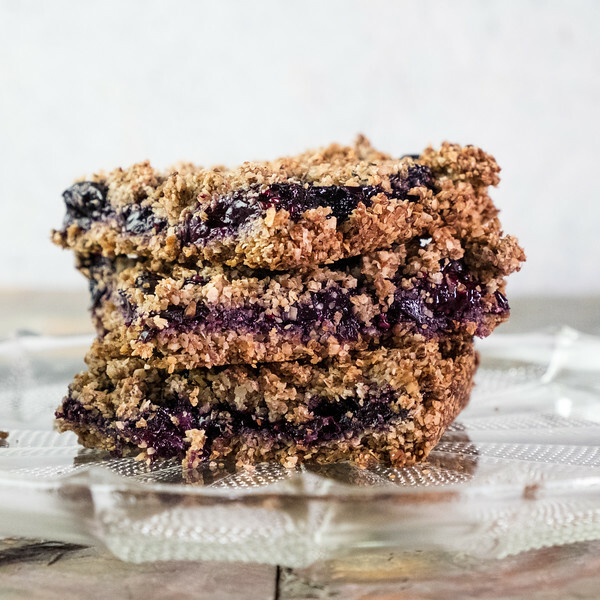 This Oat Bran Blueberry Crumble is filled with all sorts of healthy things, like chia seeds and flax seeds, making you feel good about eating dessert! It’s also vegan and makes a great, healthy after school snack. Healthy Snack or Dessert or Even Breakfast! Last week I posted Blueberry Compote with Honeyed Yogurt and talked about my need for desserts. Some of you on Instagram agreed with my need for a dessert. A little something after every meal. A treat. I love sweets. I don’t just have a sweet tooth, I have sweet teeth. It takes every once of my willpower to not eat candy, donuts, brownies, and anything else that crosses my path. So, I am on a constant search for healthy desserts or snacks. 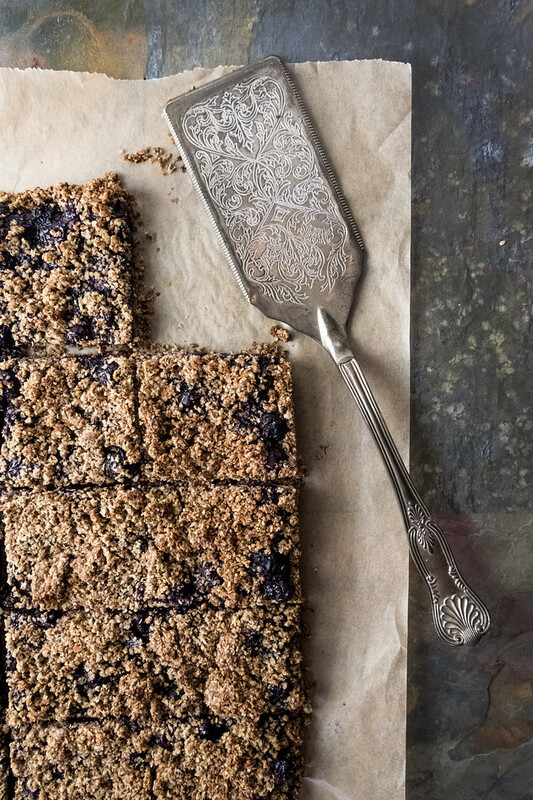 Food that I can feel good about eating, like this one, Oat Bran Blueberry Crumble. Now, I am not going to lie and tell you that this tastes just like those sugar laden crumbles that we all love. The ones that are light as air and also light on nutrients. This tastes like it’s good for you. It’s hearty and filling, satisfyingly chewy and crispy. It’s a dessert you can feel good about eating. It would also make a great snack! It says to serve it with yogurt. I crumbled it up with layers of yogurt for a delicious good for me parfait. Process oat bran, LSA (a mix of flax seeds, sunflower seeds and almonds,) dates, oil and vanilla in your favorite food processor. Hold back a cup of the mixture. Line a 9×13 baking pan with parchment paper and spread the rest of the mixture on the bottom of the pan. Bake. Cook your blueberry mixture in a medium saucepan. 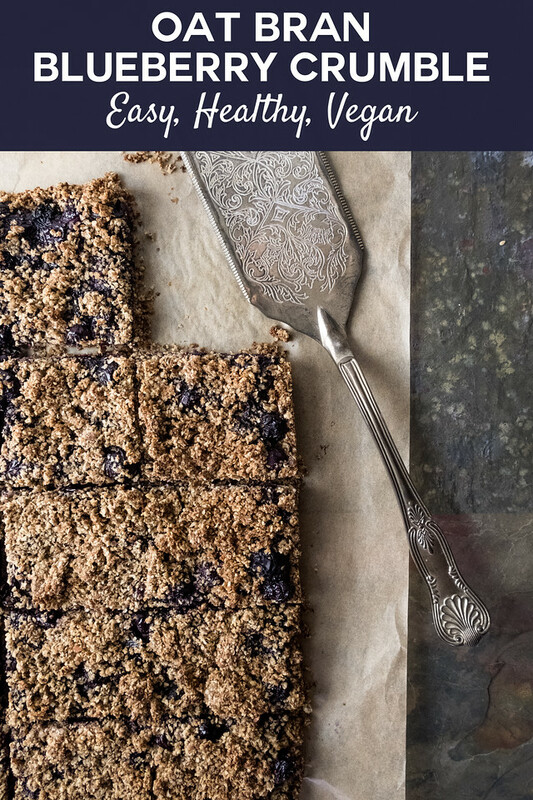 Remove the bottom crust from the oven, spread over the blueberry mixture and top with reserved oat bran mix and bake again. I found this in Donna Hay’s Fresh and Light magazine, which is sadly no longer being produced. Preheat the oven to 325. In a food processor, combine the oat bran, LSA, dates, oil and vanilla. Process for 3-4 minutes or until the mixture comes together. Reserve 1 cup of the mixture. Lightly grease a 9x13 baking pan and line with parchment paper. Using the back of a spoon, press the rest of the oat bran mixture into the bottom of the pan, forming the bottom layer of your crumble. Bake for 18-20 minutes or until just golden. While that is baking, combine the blueberries and sugar in a medium saucepan over medium heat. Cook for about 4 minutes, stirring, until the blueberries start breaking down. Add the chia seeds and cook for 10 more minutes, stirring occasionally. Remove the base from the oven and spoon over the blueberry jam. Crumble over the top the reserved 1 cup of the oat bran mixture. Bake in the oven for 20 minutes or until golden. Place in the refrigerator to cool completely before cutting into 15 squares. You can serve with yogurt if you'd like. LSA is a mixture of ground flax seeds, sunflower seeds and almonds. If you can't find it, you can make your own with a food processor. More healthy favorite snacks are these Coconut Chia Bars and this Homemade Hummus. The instructions mention oil, but the ingredient list does not. Can you please tell me what kind of oil to use and how much? Thank you! So sorry! I updated the recipe. It called for 1/2 cup of coconut oil, melted. Though I you could probably use any neutral or nut oil. This looks incredible. I love that it is healthy. I must admit I do like that little something after dinner. As I have just finished dinner, I want a whole lot of something of this. Looks sensational! I love the look of these, I always have a sweet tooth after dinner so these sound perfect for me! I want to try this, I am glad I still have some blueberries outside. I’m having my morning coffee and this would go so well with my coffee.